My principal teachers in theater have been and remain actors whose job it is to live within the tight confines of a written text, and for whom personal relationships on stage go beyond the dialogue the speak with their partners. Such actors reach into the deepest recesses of our experience and I find that spellbinding. I love theater that casts spells. When I studied at the Novosibirsk Theater Institute, the Red Lamp (Krasny Fakel) Theater there was called the Siberian Art Theater. Our course was run by Alexei Malyshev, who had studied at the Moscow Art Theater, and our teachers were Vyacheslav Garin, who had studied at the Shchepkin Institute of the Maly Theater in Moscow, and Yelena Popenko, who had studied at GITIS (the State Institute of Theater Arts) in Moscow. After I played Peewit in a show called The Shortest Night of the Year in my third year at the institute, I was invited to join the troupe of the Red Lamp Theater. My first major role there was Valentina in Mikhail Roshchin's Valentin and Valentina, as directed by Konstantin Chernyadev. 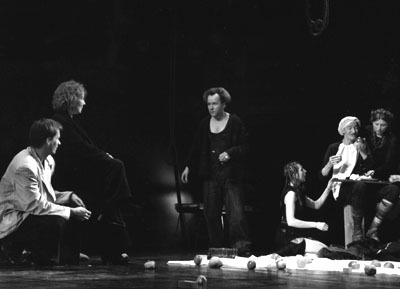 Over a six-year period at the Red Lamp, I played numerous roles, including Katya in Gorky's The Barbarians; Kate in Yulian Semyonov's Seventeen Seconds in Spring; Jill in John Galsworthy's Without Gloves; Tanya in Vladimir Voinovich's Two Comrades; and Ksenia in Alexander Pushkin's Boris Godunov, a production that enjoyed especial success for the modern interpretation given it by director A. Sagalchik. I have lived and worked in Moscow since 1991. At the Russian-Bulgarian Chamber Theater I most often played in Bulgarian plays, but I also performed as Alexandra in Nadezhda Ptushkina's By the Light of Others' Candles and as Clare in Tennessee Williams's The Outcry. This latter show was performed in two different versions, the first directed by S. Steblyuk, the second directed by Nikolai Popkov. For m performance of Clare at the International Theater Festival in Tolyatti, I was awarded the honor of Best Female Performer. In Ariston I played the role of Jocasta.